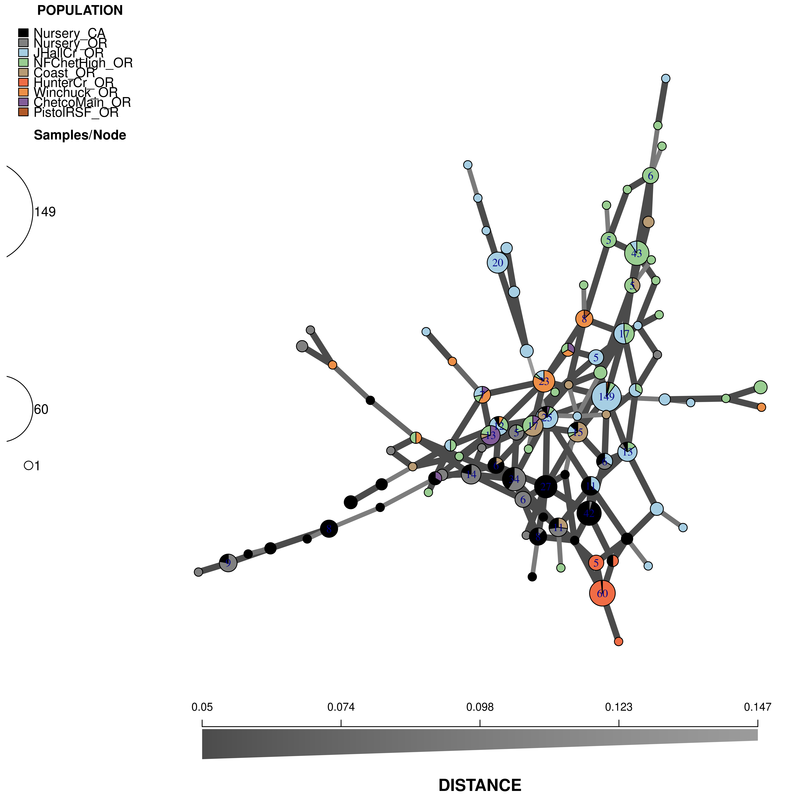 Minimum spanning networks (MSN) are a great way to visualize relationships among individuals in your data. 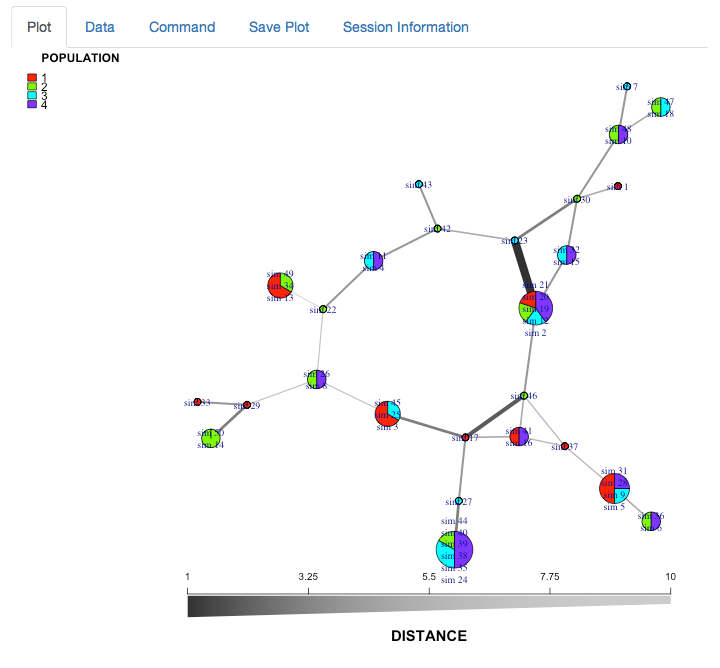 Particularly for clonal organisms it can be a more powerful visualization tool than trees. In this chapter, we will show you how to construct and view minimum spanning networks on the command line and in an interactive viewer. Are the major genotypes of Fruit Rot (FR) samples closely related? To what degree do the Blossom Blight (BB) samples contribute to the FR? We notice that tree number 26 is the only one to have been sampled for all three years. Let’s use it as an example. We can see that the Blossom Blight in the tree (pink pie slices) heavily contributed to the major groups of MLGs found in the Fruit Rot (blue pie pieces). Try it for yourself! See if you can produce similar graphs with the 2010 and 2011 populations. 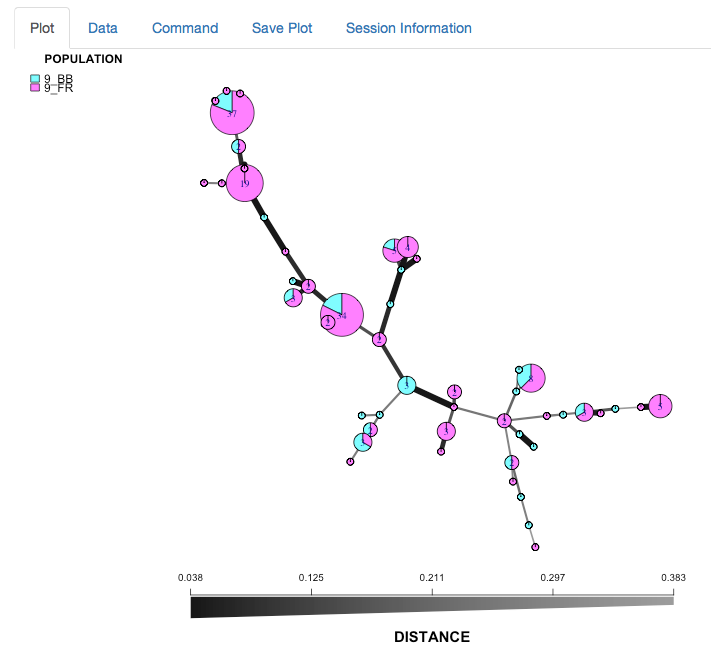 We created the interactive tool imsn() to facilitate interactive plotting. 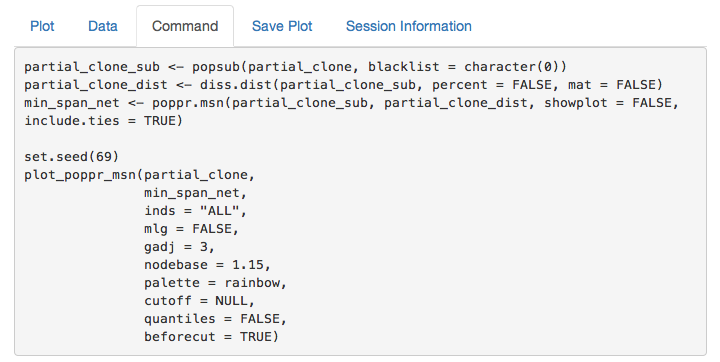 This function will be able to create minimum spanning networks from all genind objects in your current R session. In this section, we will recreate the plot above. First we will make sure that we have all the data we need and then we will run imsn(). Note: you will not be able to access your R console after running this function until you close the pop-up app. We can see that there are five tabs and a sidebar. For now, we’ll explain what is on the sidebar. The first thing you see is a green bar that says “ready”. This means that there are no processes going on in the background and that it’s waiting for input. 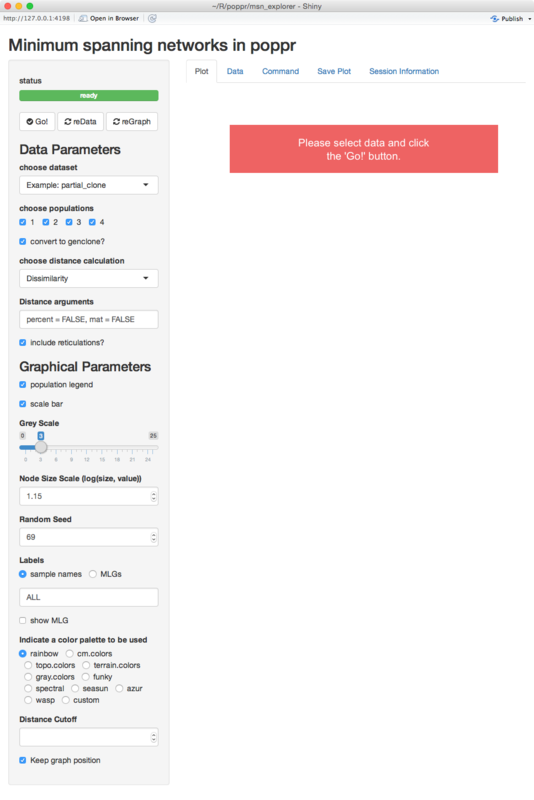 Below that are three buttons: Go!, reData, and reGraph. These tell the program that you are ready render your graphs. Notice that there are two main sections, Data Parameters and Graphical Parameters. 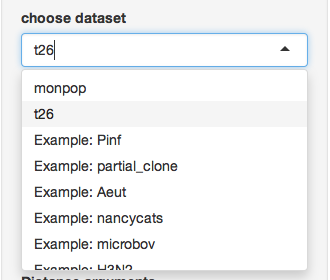 Choose dataset - This dropdown menu allows you to choose your data set. Include reticulations? - This is an important parameter that will include reticulations in the minimum spanning network. We’ll explore this with the Pram data set later. The parameters listed here allow you to modify the look and feel of the graph without having to recalculate the data. We encourage the user to play around with these to see what the different sliders and buttons do. This is the tab you see immediately. It has nothing in it because we haven’t told imsn() to do anything. Let’s hit Go! 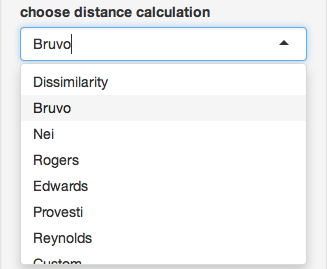 with our default parameters and see what happens. 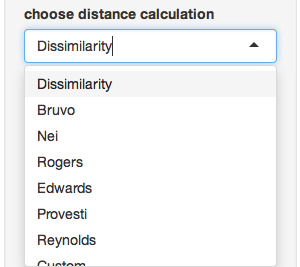 We now have a minimum spanning network of partial clone based a dissimilarity distance (“diss.dist”) where the distance is represented as counts of dissimilar alleles. This is the output of your data set. You can use this to confirm that your data is what you expect. If you copy and paste this command into your R console, you can recreate the minimum spanning network. 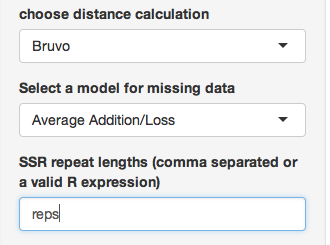 This is important to make sure that your figure is reproducible. This allows you to save the plot to your computer in pdf or png format. 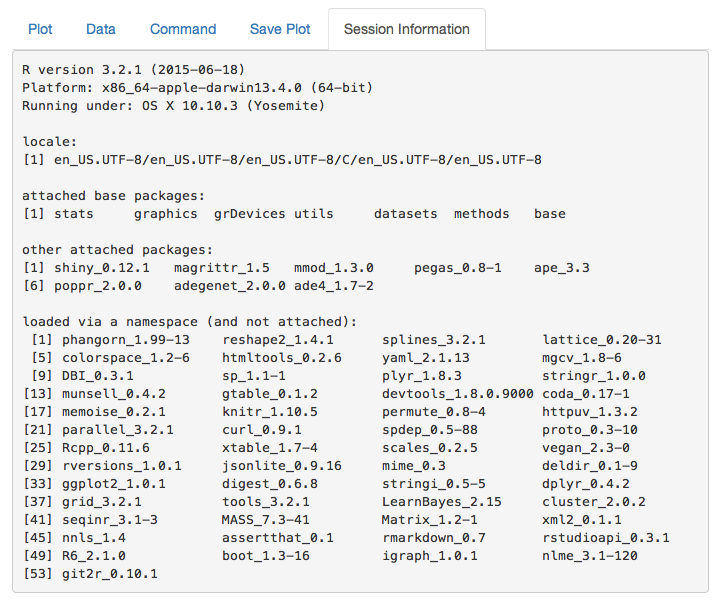 This shows you what package versions were used to create the graph. We will now recreate the minimum spanning network that was displayed for the monpop data set. 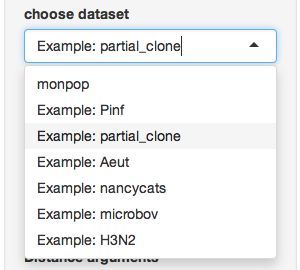 Next, make sure you only select the “9_BB” and “9_FR” populations. reps # our previous definition of "reps"
Now we will use data from Kamvar et al. (2015). 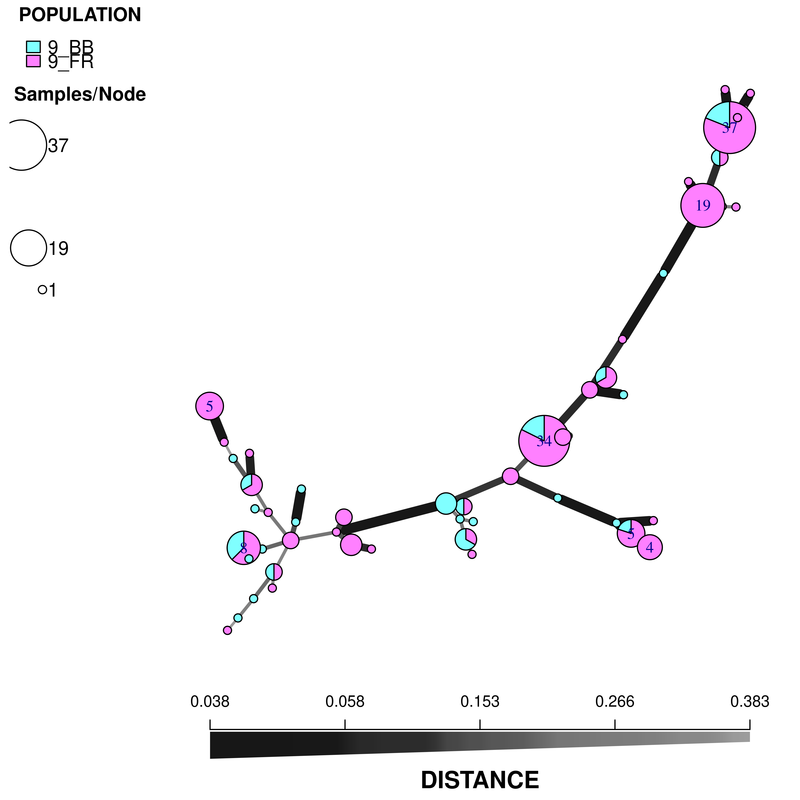 This is the Sudden Oak Death pathogen collected from forests in Curry County, Oregon and nurseries in California and Oregon (Goss et al., 2009). 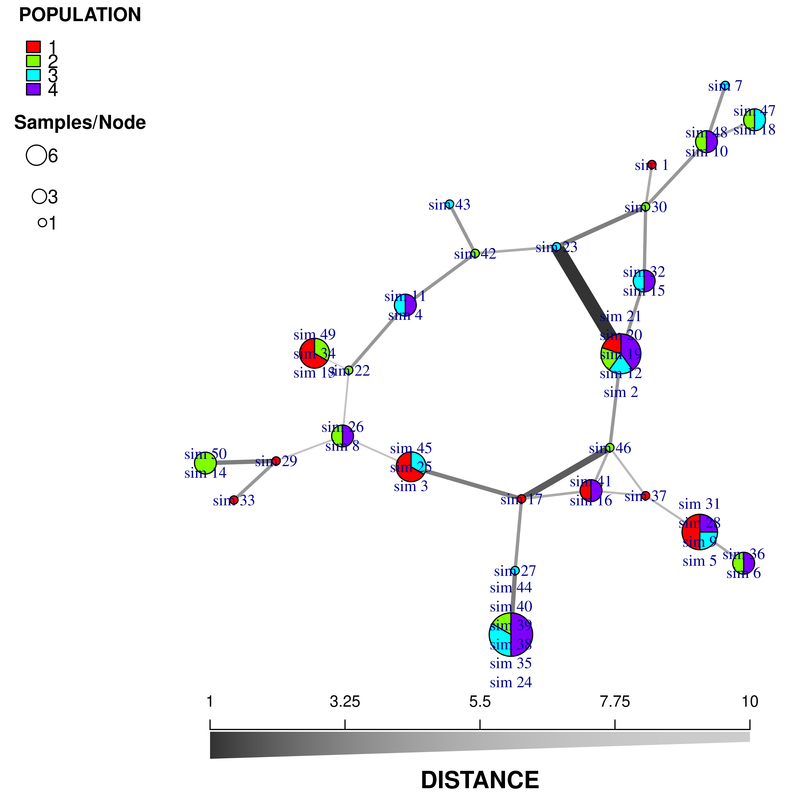 We will use this data set to see why reticulations are important for highly clonal organisms. This data has a few things in the “other” slot that we need. First is the repeat lengths called “REPLEN” and the other is a vector of hexadecimal colors for each population called “comparePal”. ##     "#000000"     "#808080"     "#A6CEE3"     "#99CD91"     "#B89B74"
##     "#F06C45"     "#ED8F47"     "#825D99"     "#B15928"
When you finish your session, you can exit the app by closing the window.